Eggs will always be one of my all-time favorite foods-- scrambled, poached, boiled, sunny side up-- there are so many ways to cook them! Even though eggs are often considered a plebeian breakfast food, when cooked right, they can truly be an elegant, beautiful element to a dish. Eggs are also one of the most filling, nutritious foods out there, and they're very versatile, lending to many combinations. Moreover, eggs cook in a matter of minutes, and when I'm exhausted after work and want a quick dinner, I'll often make an omelet or scrambled eggs. The key to perfect eggs is to not overcook them-- there's nothing worse than biting into a boiled egg to find a solid yolk that's been cooked to death. Whether it's poached, scrambled, or sunny side up, having a yolk that's slightly runny elevates the humble egg to a whole new level! Eggs are a perfect example of how being a good cook involves mastering the technique. When I first started cooking in high school, I used to think that simple dishes such as scrambling eggs were not even considered cooking. Back then, I used to mash up eggs as much as I could with a spatula and cook them excessively until they started to turn brown, because that's what I was used to seeing in diners (and partly due to the fact that I used to be deathly afraid of raw yolk). Now I feel ashamed when I think about how I had treated those poor eggs! A few years ago, I had a revelation when I tried the method recommended by Jamie Oliver in his cookbook, Jamie's Food Revolution (my very first cookbook)! The use of butter, along with the slightly undercooking, resulted in smooth, fluffy scrambled eggs! I haven't used any other method of scrambling eggs since then-- I tried to break down the steps here as much as I could, so I hope you try this out, and realize just how elegant and delicious scrambled eggs can be! 1. Crack the eggs into a medium bowl. Add a small pinch of salt and black pepper and beat together with a fork or whisk. 2. Melt the butter on low heat in a medium saucepan. 3. Once the butter starts to bubble, pour the eggs into the saucepan. 4. Every 5 seconds or so, gently stir the eggs with a spatula or wooden spoon, making sure to reach every edge of the pan. 5. Stir the eggs for a few minutes, until they form medium curds while still looking slightly underdone and silky. The eggs will continue cooking as they cool, so remove from heat when they are slightly runny. Transfer to a plate and top with more freshly ground black pepper if you wish. Enjoy! 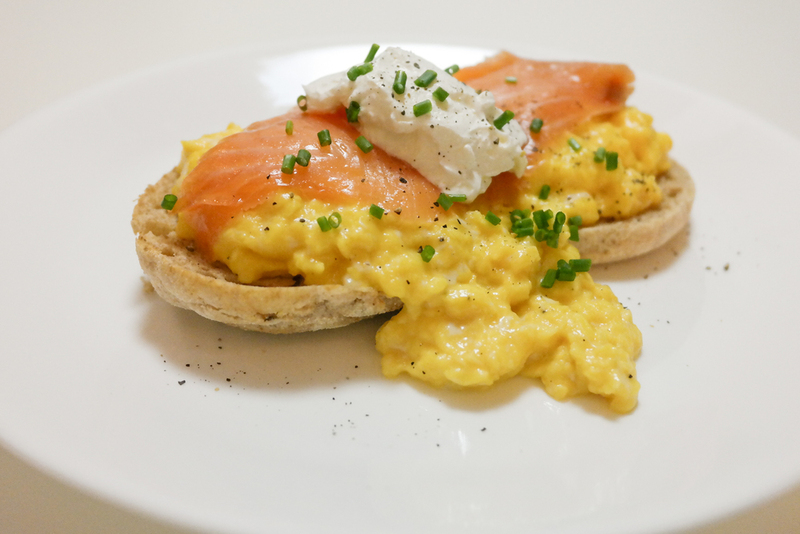 In this picture, I served the scrambled eggs with an English muffin, smoked salmon, sour cream, chives, and lemon juice (and a healthy sprinkling of black pepper)! Feel free to enjoy the eggs by themselves or with any other combination you can think of! With bacon, cheese, avocados, tomatoes, herbs-- the possibilities are endless!